Ever wondered why Birmingham airport was renamed the Birmingham-Shuttlesworth airport in 2008? BLACK AND WHITE (Calkins Creek) by Larry Dane Brimner will have you cheering each time you hear the name. As Brimner notes: "Reverend Fred. L. Shuttlesworth never once thought about giving up the fight for human and civil rights. He was, after all, following the path God intended for him, and he'd answered that calling early in his life." The best children's non-fiction history books chronicle events by combining arresting visuals with lucid prose. 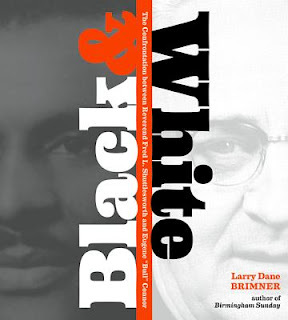 Thanks to Brimner's gifts of storytelling and research, a meticulous collection of photographs and letters, and a design that brilliantly pleads the case for the traditional codex, BLACK AND WHITE transports readers into the heart of the civil rights movement. The book brings two characters to life--Shuttlesworth and his nemesis, Eugene "Bull" Connor--as well as the town of Birmingham in the middle of the twentieth century, helping us remember the sacrifice and determination that secured changes we might start taking for granted. A rousing portrayal of what faithful Christians can and have endured to bring about justice, BLACK AND WHITE singlehandedly makes me proud of our vocation to nourish the imaginations and intellect of the next generation.